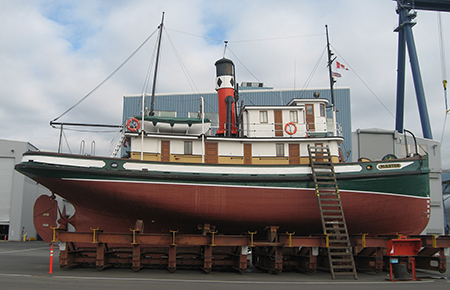 The SS Master Society is dedicated to the preservation and restoration of the Steam Tugboat SS Master, a truly iconic maritime symbol of the BC towing industry. To that end, we have launched the SS Master Centenary Project with the objective of completely restoring the Master before her 100th birthday celebration in 1922. Estimates for the full scope of repairs are $1,000,000, with the bulk of funds required now, to ensure timely restoration. Essential repairs include replacement of the aft bulwarks, rim timber, deck beams, horn timber, replacement of upper deck, main deck beam repair, replacement of wheelhouse roof, and numerous other repairs to deck and house. The historic steam tug Master was built in Vancouver’s False Creek in 1922. She worked the BC coast for 37 years towing logs and barges laden with coal, limestone, or gravel. Unfortunately, the Master is the last of her kind in North America, having a wooden hull and original steam-driven machinery. The Master is the iconic working vessel of the BC west coast today, representing the legacy of towboats, shipbuilding and design that has played such an important role in the economic development and character of the BC coast. At 90 years of age however, the Master’s future hangs in the balance, and needs the support of everyone in BC who works in, on or around the waterfront. So why should we keep the old tug Master afloat? It has to do with the recognition and appreciation of our Province’s maritime heritage, celebrating those who came before us building the foundations upon which the abundant life we enjoy today is based. It has to do with recognizing publicly and prominently the vital role that the towboat industry has played and continues to play in the commerce of British Columbia today. Virtually all goods and services to BC coastal communities move by tug and barge. This project is an excellent opportunity for BC mariners, boaters, shipyard workers, marine workers, all marine-related industries, and the towboat industry in particular to demonstrate a pride and determination equal to that shown on the east coast in the recent rebuilding of the Bluenose. The Master is the west coast equivalent of the Bluenose and even more importantly, is uniquely an original vessel, not a replica. As documented in many books and publications, the BC towboat history is full of extraordinary characters and stories of incredible enterprise. Many rugged individuals from designers and builders to Captains, crew and Owners worked hard to establish the BC towboat industry as one of the largest and most important in the world from the 1870s to the present day. These same abilities today can help to preserve our industry’s living history as represented by the Master. Most great cities in the world feature an historical vessel on their waterfront. Think Cutty Sark, HMS Victory, USS Constitution, Queen Mary, Kon Tiki, and many more. These vessels all have community and civic (and frequently national) support. San Francisco has Hercules, a steel steam-powered tug and C.A. Thayer, a west coast lumber schooner rebuilt at a cost of $14 million. San Diego has Star of India and others. Washington State has the steamship Virginia V (a $6.5 million restoration), WT Preston in Anacortes and the Sand Man tugboat in Olympia. In each case communities and societies have raised money, put in a huge effort and preserved a critical part of their local maritime history and identity. In each case people have said that this vessel is too important to our heritage and identity to let it go derelict. In BC, the citizens of Campbell River deserves great credit for preserving the wooden seiner BCP45 in their Maritime Heritage Centre, and the Vancouver Maritime Museum features the RCMP St. Roch. Both vessels are however locked on land. Vancouver has no working vessel other than the Master that is on the water; original, functional, meaningful to local maritime history, and accessible to the public. The Master is fully engaged with the public for much of the year at Granville Island and visitors from all over the world are thrilled to experience this vital part of BC history. The Master also steams to many other places in BC to attend events and festivals as an ambassador of the BC shipbuilding and towing industries. However at her mature age, Master can no longer be preserved by a handful of committed volunteer Society members; far greater support and resources are required. The Master requires and deserves the support of everyone in this country who values our maritime heritage. This announcement of the SS Master Centenary Project is the beginning of the process of preserving this iconic, unique, and valuable tug as the last existing operational wooden steam tug in North America. Master is the emblem of the BC coastal towing industry, and ably represents the unique history of the working BC West Coast. Please get on board and lend your support for the SS Master Centenary Project!